Take Current Affairs quiz March 15, 2019 to enhance your General Awareness. Practice with our esteemed Current Affairs quiz March 15, 2019 questions which covers all important events across India as well as World. Make use of all important Current Affairs quiz March 15, 2019 questions with answers updated here, at free of cost to succeed in all competitive Exams and Interviews. Which of the following State plans for cloud seeding project due to drought? The government of Karnataka is planning for cloud seeding project due to drought and to influence the upcoming monsoon and capture as much water as possible from the rain clouds. NTPC has partnered with ________ for fly ash transportation. State-run National Thermal Power Corporation Ltd. (NTPC) has teamed up with the Indian Railways for fly ash transportation. India Infrastructure Trust acquired acquired RIL's East West Pipeline for __________. India Infrastructure Trust, an infrastructure investment trust (InvIT), sponsored by Brookfield, will acquire the East West Pipeline for Rs. 13,000 crore. The pipeline is owned by Reliance Industries Ltd’s promoters’ family. Which city hosts Special olympics World Game 2019? Special Olympics World Games 2019 is held at Abu Dhabi, from March 14 to 21. The Games were declared open by Sheikh Mohamed bin Zayed Al Nahyan, Crown Prince of Abu Dhabi. DRDO successfully test fired Man Portable Anti-tank Guided Missile (MPATGM). What is the maximum engagement range of that missile? The MPATGM is a third-generation anti-tank guided missile (ATGM) comes loaded with a high-explosive anti-tank (HEAT) warhead. It has a maximum engagement range of about 2.5 kilometers. For how much, Reliance Infrastructure (RInfra) will sell its entire stake in Delhi-Agra Toll Road to Singapore based Cube Highways and Infrastructure? Reliance Infrastructure (RInfra) has signed a "definitive binding agreement" with Singapore-based Cube Highways and Infrastructure for sale of its 100 per cent stake in Delhi-Agra (DA) Toll Road Pvt Ltd. The deal is valued over Rs 3,600 crore. Three Kirti Chakras and 15 Shaurya Chakras awarded by the President to Army Personnel. Smart Weapon from JF-17 fighter jet successful test fired by Pakistan. Election Commission of India is to launch _________ to help the poll observers during the Lok Sabha election 2019. The Election Commission of India (ECI) is to launch the Observer App, a mobile application, that will help poll observers to submit reports. Who is the Chairman of Life Insurance Corporation of India (LIC)? M.R.Kumar, the newly-appointed chairman of Life Insurance Corporation of India (LIC), has taken charge on 14th March. Olive Ridley falls under _________ category of the IUCN Red List. Olive Ridley falls under Vulnerable Category in the IUCN Red list. When is the World Consumer Rights Day celebrated? The consumer movement marks 15th March with World Consumer Rights Day every year, as a means of raising global awareness about consumer rights and needs. Which city has topped the Mercer's index of most liveable cities for the 10th year in a row? The Austrian capital Vienna has topped Mercer's index of most liveable cities for the 10th year in a row. Zurich in Switzerland, is placed second in the index, while Auckland, Munich and Vancouver came joint third. Who is the present Army Chief of India, who was recently conferred with the Param Vishisht Seva Medal (PVSM) by President? General Bipin Rawat is the 27th Chief of Army Staff of the Indian Army. He assumed office on 31 December 2016 after the retirement of General Dalbir Singh. He was recently conferred with the Param Vishisht Seva Medal (PVSM), the highest military medal award in recognition of peace-time service not accounting to gallantry, by President Ram Nath Kovind. Who bagged the Commonwealth Youth Award for the Asian region? Padmanaban Gopalan bagged the Commonwealth Youth Award for the Asian region. 16-year-old Greta Thunberg nominated for this year’s Nobel Peace Prize. Which country she belongs to? Greta Thunberg, the 16-year-old Swedish student and activist has been nominated for a Nobel Peace Prize for her efforts in climate activism and fighting global warming. 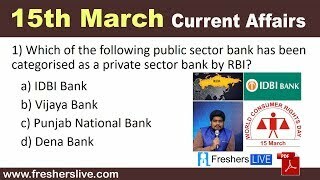 Which of the following public sector bank has been categorised as a private sector bank by RBI? IDBI Bank has been categorised as a private sector bank for regulatory purposes with effect from January 21, 2019. This follows Life Insurance Corporation of India (LIC) acquiring 51 per cent of the total paid-up equity share capital of the bank. Russia country released coin commemorating annexation of Crimea. Are you looking for right place to enhance your Knowledge on Current Affairs of 15th March 2019 through effective Quiz section? FreshersLive grants you the advantageous Current Affairs Quiz questions with accurate answers for 15th March 2019 which covers all the important events, supreme Awards, major occurrences in the National as well as World level. All important Current Affairs Quiz questions of 15th March 2019 are updated instantly in this page. Everyday at least 25+ Current Affairs Quiz Questions are displayed in this FreshersLive page. Correct Answer for each quiz question is given at the end of the entire 15th March 2019 Current Affairs Quiz questions section. You can estimate and upgrade your GK by attending these useful quiz questions. Entire quiz questions of 15th March 2019 Current Affairs covers Competitive Exam as well as Interview point of essentially important topics like International News, National News (ie. Indian Affairs), Science & Technology News, Environmental News, Bills & Acts Passed by Government, Defence News, About important Persons, Places, Banking & Economical News, Awards & Honours, Sports News, Revolutionary Updates on Arts & Culture, Obituary, Summits & Conference, Important Committee, Schemes, Appointments, Important Days & its Theme for Current as well as upcoming Year, Books & Its Authors, Agreements & MoUs, Budget, Taxes, Various Important Lists & Indexes, Visits by World Presidents, Prime Ministers, Political affairs and all Current Events. 15th March 2019 Current Affairs Quiz Questions updated in this page are prepared in the sense to help all aspirants to succeed in various Competitive Exams like UPSC IAS and other Civil Services Examination, Various Bank exams like IBPS PO, IBPS Clerk, SBI PO, SBI Clerk, RRB PO, RRB Assistant, Insurance exams like LIC AAO, UIIC Assistant, Railway Exams, Various Central Government Exams like SSC CGL, SSC CHSL, and more. Attempt all the Current Affairs Quiz Questions of 15th March 2019 and evaluate your score by matching your response with the correct answers mentioned at the end of this quiz questions section. By practising the FreshersLive Current Affairs Quiz Questions on a daily basis, you can surely succeed in the competitive exams as well as the interviews easily. Make use of this ultimate resource to the fullest and quickly achieve your goal!